Claims that one of history's greatest ships could never sink were never made during the Titanic's short lifetime and are a classic example of myth creation, according to a British academic. Richard Howells, lecturer in communications studies at Leeds University, says in a new book, The Myth of the Titanic, that it was only after the liner had gone down that she was described as being unsinkable. "As soon as the Titanic sank, everyone decided it was the great unsinkable ship, but it was never, in fact, publicised as being an unsinkable ship," he said. ... The belief that the Titanic's builders had promoted her as the world's first unsinkable ship has been repeatedly reinforced over the years in books and films about her maiden voyage in 1912, when she sank after hitting an iceberg. James Cameron's film Titanic has the heroine's mother looking up at the ship before she set sail and remarking: "So this is the ship they say is unsinkable? " Yet, Dr Howells claims that an extensive search of the Titanic literature at the time has revealed only three instances when the word "unsinkable" was mentioned in print - and then only with the proviso "practically". 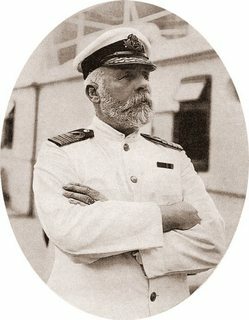 "The population as a whole was unlikely to have thought of the Titanic as a unique, unsinkable ship before its maiden voyage," he said. Was the Titanic ever advertised as being "Unsinkable"? 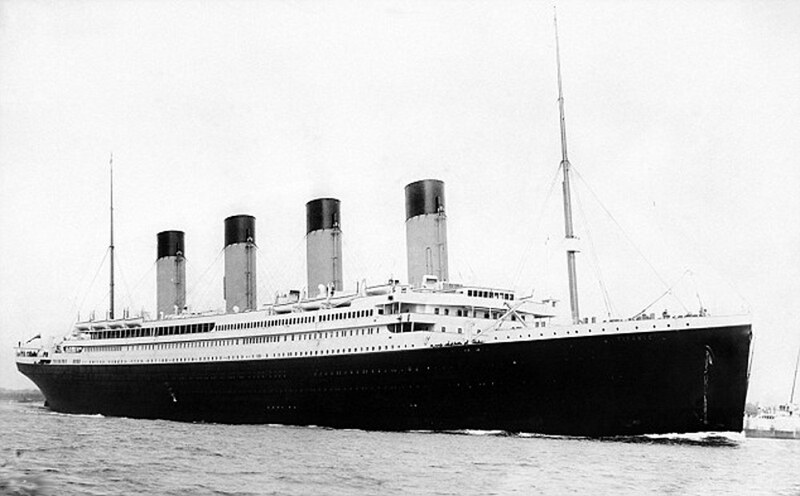 the Olympic is unsinkable, and the Titanic will be the same when she is put in commission. “While we have had no direct wireless communication from the Titanic,” said Mr Franklin, “we are satisfied that the vessel is unsinkable. There is also this nice, but old page which describes the available evidence. 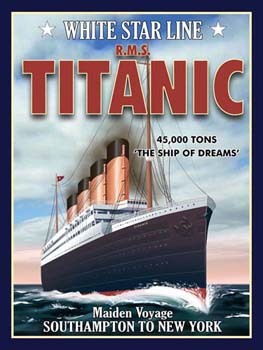 Contrary to popular opinion, there is a considerable body of evidence which proves pretty conclusively that the Titanic (as well as the Olympic) was called unsinkable not only in pre-disaster publicity brochures and newspaper articles but that there was a widespread oral tradition to that same effect -- a tradition that seems to have been promoted by top individuals at both Harland and Wolff and the White Star Line. Funnily enough, Wikipedia looks at the same evidence and finds it relevant to claim that the ship was only claimed to be "virtually unsinkable" until the sinking — they do not provide any reason or strong reference as to why it would make a difference. Finally there is at least one book (The Myth of the Titanic, by Richard Parton Howells, Macmillan, 1999, ISBN 0333725972, 9780333725979) taking the opposite stance. I cannot access it or review the quality of the evidence presented. The general consensus was the Olympic class ships were "practically" unsinkable, or "virtually" unsinkable, or various other qualifiers that most members of the travelling public tended to ignore. In the worst case it was believed these ships would take days to sink, plenty of time for a safe evacuation. But at the time people thought most modern ships were practically unsinkable so it wasn't really outstanding for Titanic to share that label too. I will say that I cannot imagine any condition which could cause a ship to founder. I cannot conceive of any vital disaster happening to this vessel. Modern shipbuilding has gone beyond that. 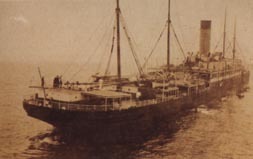 Given that the British Board of Trade regulations (which had last been revised in 1906 when the 20,000 ton Adriatic was fitting out) made it legal for steamers over 10,000 Tons to vastly under-provision lifeboat places, it would seem that few people in 1912 seriously believed that any modern ship would sink before other ships reached her. If a ship did sink the expectation was that it would take days to happen, and other ships would arrive and loan their lifeboats to the stricken vessel to make up the shortfall in boat capacity. Indeed, this is exactly what happened when the 15,000 ton RMS Republic sank. That ship took over a day to sink and aside from those killed in the initial collision, everybody got off safely and were transferred to rescue ships long before that happened. Like Titanic, Republic was a White Star ship, and had been built by Harland and Wolff. While considerably smaller, she would have employed similar construction techniques and general layout of safety features of her larger successor. 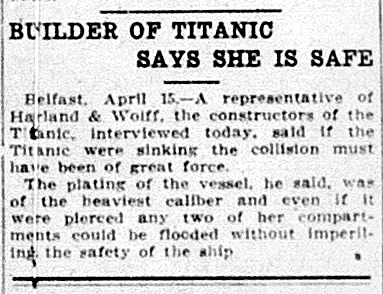 And like her successor, she was also considered "practically unsinkable". On a personal note, I can't help feeling sometimes that you almost have to admire the innocent optimistic arrogance of the Edwardians. It's charmingly quaint. UPDATE: I now have a primary source for the claim that the Titanic was expected to remain buoyant for a long time after an accident so I'm updating my answer to include it. Ruth Blanchard's mother was apparently nervous about sailing on the Titanic, due to it being a new, untested ship. The purser reassured her that should the ship be damaged, her watertight compartments were certain to keep her afloat until help arrived. This is an interesting remark because it supports the "unsinkable with caveats" view that appeared to be common at the time. No one ever claimed that the Titanic was "unsinkable". The quote, "practically unsinkable" was taken out of context. 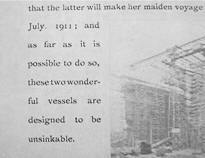 In 1911, Shipbuilder magazine published an article describing the construction of the Titanic. The article stated that when the watertight doors were closed, the ship would be "practically unsinkable". Not the answer you're looking for? Browse other questions tagged history titanic . Were Mermaid passengers shipwrecked by 5 different vessels before being successfully rescued?